Raheem Sterling of Manchester City. Sergio Aguero became the second-fastest player to reach 150 Premier League goals as he and Raheem Sterling inspired Manchester City to a crushing 6-1 win over Southampton. Belgium international De Bruyne was ruled out with another knee injury this week, but that had little impact as City blew poor Saints away, Aguero taking his tally to 150 goals in 217 league appearances, while the excellent Sterling got himself a brace. Hoedt’s own goal gave City a sixth-minute lead, the centre-back – whose initial failed clearance brought about the move – finding his own net when attempting to keep Sane’s shot out. Aguero doubled their tally from close range after Sterling breezed through Saints’ hapless defence and passed into the danger zone. Sterling was integral again for the third, with his cross nudged on by Sane, and Silva smashed home on the volley. 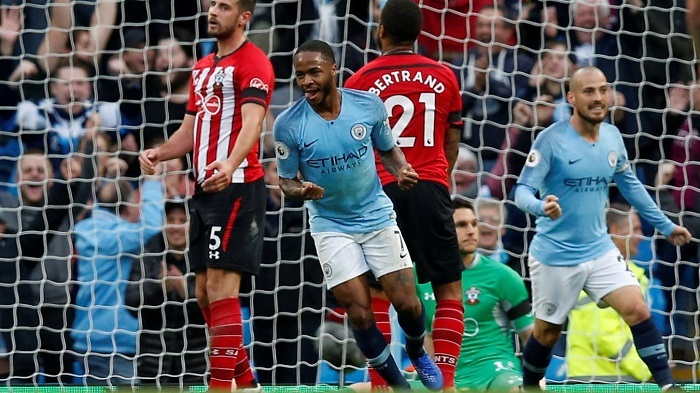 Ings’ penalty – after Ederson hauled him down – saw Saints pull one back, but Sterling restored the three-goal cushion just before the interval, slotting home after tireless work from Aguero. The visitors initially improved after the break, with James Ward-Prowse and Ings forcing Ederson into three vital saves between them. But City still looked in control and they got a fifth just past the hour – Sterling drilling under Alex McCarthy after Aguero fed him into the area. Sane completed the rout with a sixth in the closing minutes, picking out the bottom-left corner from the edge of the box after being found on the break by Sterling. Losing a player of De Bruyne’s quality for three months – the time he will have missed by the end of his latest lay-off – in a single season would be enough to derail any club’s title challenge, but City did not really miss him before and they were exceptional without him on Sunday. That in itself is impressive. Two assists, a key role for Silva’s goal and two strikes of his own – there is not much more Sterling could have done. The England international was absolutely everywhere, no wonder he is reportedly in line for a new five-year contract. It may be harsh to single out one Saints defender given they were all dire, but Hoedt arguably endured the most difficult outing, haplessly giving City the lead. City welcome Shakhtar Donetsk In the Champions League on Wednesday, before returning to domestic action – also at home – for the Manchester derby in a week’s time. Southampton will be hoping to arrest their slump on Saturday against Watford.